While Walmart may not be exactly synonymous with sophisticated home design now, that could all change if Allswell has anything to do with it. 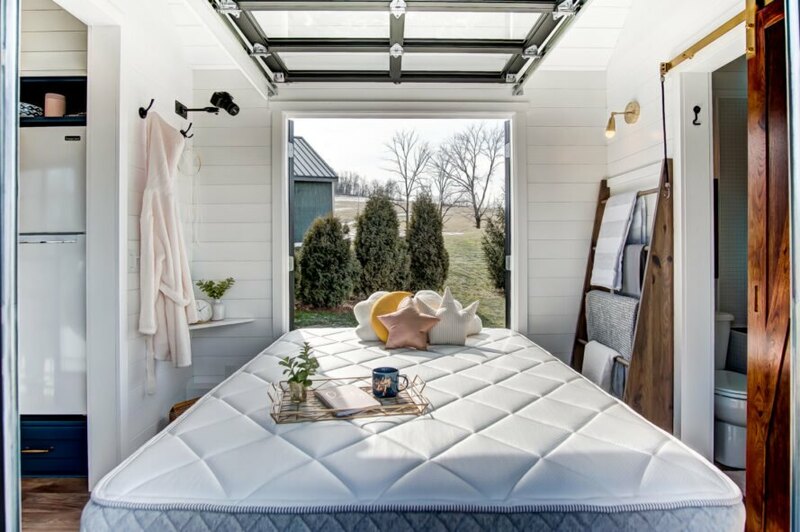 Walmart-owned Allswell is a bedding and mattress company that is using a stunning tiny home, designed by the creative team from Modern Tiny Living, to showcase its quality mattresses. Setting off across the country on February 8, the gorgeous tiny home on wheels will make its way from NYC to Seattle, stopping at various sleep-deprived cities along the way. 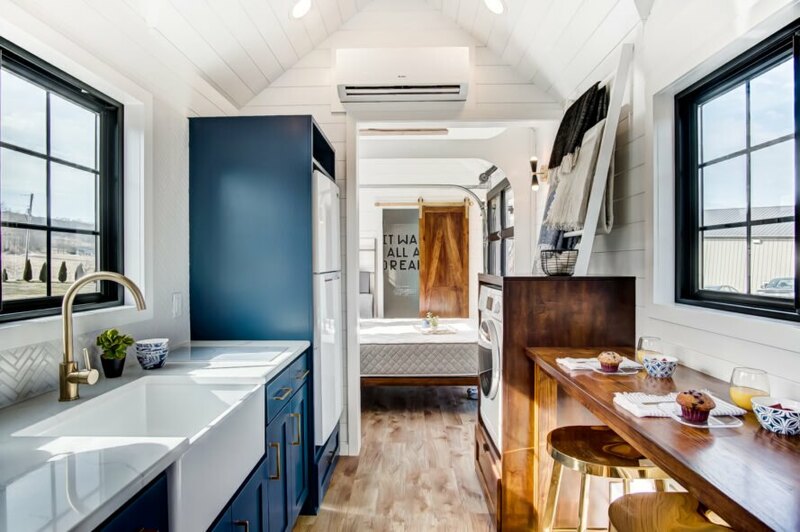 The tiny home was custom-made by the experienced tiny home builders from Modern Tiny Living. At just 200 square feet, the home is quite compact. However, working closely with the Allswell team, the company was able to deliver truly stunning results that will not only be the perfect vessel to showcase the ultra-comfy, sleep-inducing merchandise but also to feature the best of tiny home design. A black and white facade with a quaint gabled roof over the front door gives the design a traditional yet modern appearance. On the interior, all-white shiplap runs up to the high cathedral ceiling. The two thick wooden beams that cross the ceiling, along with the hard wood flooring, contrast nicely with the white walls. The interior design throughout the home is bright and airy, with a neutral color pallet that is broken up by a gorgeous blue kitchen. 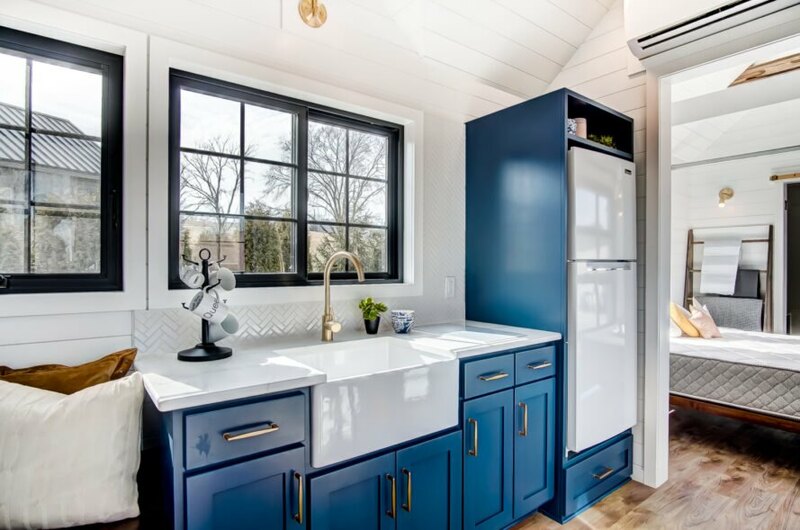 The combination of bright blue cabinets with a large, white farm sink and shiny countertops adds a contemporary touch to the design. Adjacent to the kitchen space is the Allswell tiny home’s principle feature: a large mattress. The mattress is front and center in the bedroom, easily found thanks to the fun glass-paneled garage door. On the other side of the home is another mattress that pulls double-duty as a day bed. 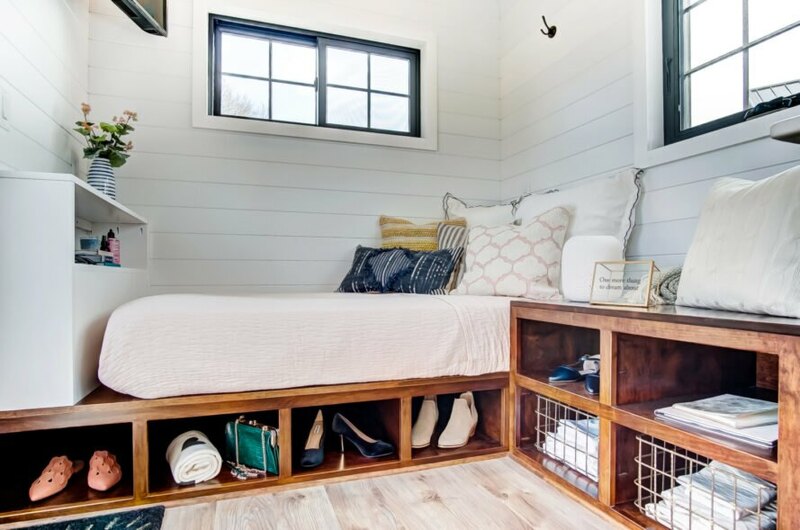 The home is outfitted with plenty of storage as well. Kicking off its tiny home tour in a city that ironically never sleeps, Allswell is currently in Union Square as it prepares for its cross-country trek. The team plans to stop in Philadelphia, Washington D.C., Atlanta, Nashville, Dallas, Austin, Los Angeles, San Francisco, Portland and will end in Seattle. Thanks for sharing this. I moved from a 3k square foot house to a 390 sq. foot studio cottage and while it was an adjustment at first and I had to get rid of a lot of stuff, it was a great move. So much easier to clean and just more carefree ! "It was all a Dream", all right.....after TEN YEARS of trying, I'm giving up on the notion that I can have my own home at 60 yrs old; I'm going to be a homeless elder on the streets once I have no paycheck, you get thrown into the street. Towns and cities use their power to deny Tiny Home living under the excuse of "public Health", but it's really money/profit related. 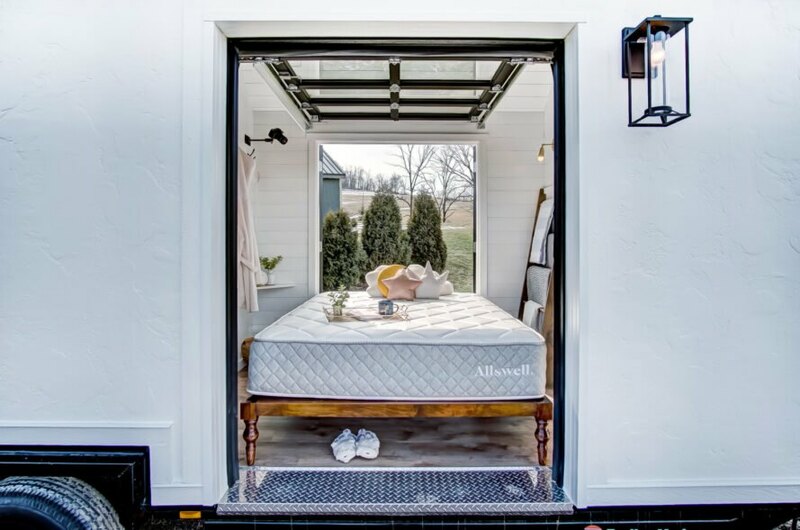 Walmart-owned Allswell is embarking on a tiny home tour across the country to showcase its mattresses. 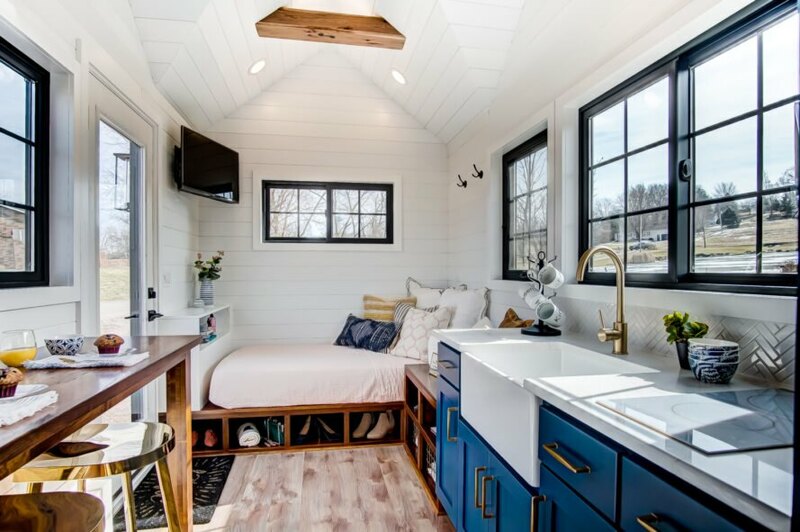 The stunning tiny home was designed by the creative team from Modern Tiny Living. 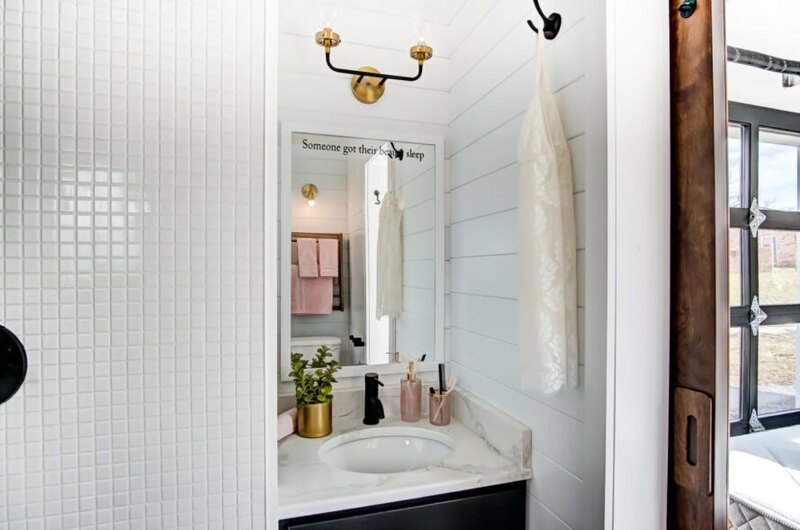 The tiny home design is fresh and airy. A narrow bar-top dining area was installed in front of a window. 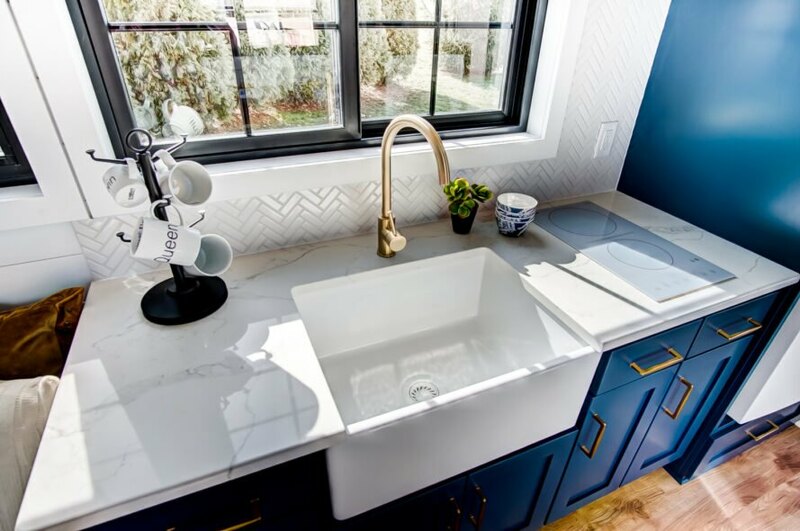 A fun blue kitchen with a farm sink and white countertops brings a bit of color to the design. Natural light from the multiple windows brightens the interior. The tour is an event to showcase the company's mattresses. The home's living space was furnished with the company's best daybed. The interior design is kept neutral to best showcase the mattresses. 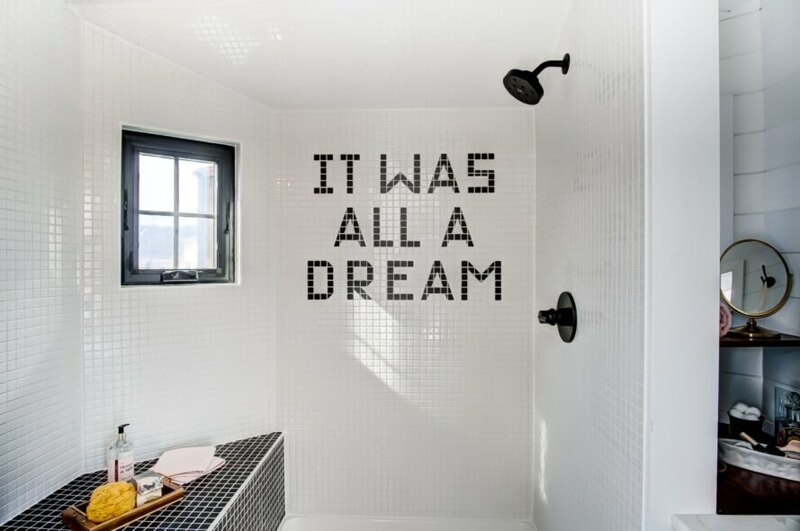 The bathroom features custom writing on the tiles. The designers went with crisp white walls to brighten and open up the small interior. The bathroom is compact but with a sophisticated design. A rolling garage door with all glass panels was installed to showcase the merchandise. We have to admit, it does look like a cozy place to nap or read a book. A glass front door welcomes in more natural light. 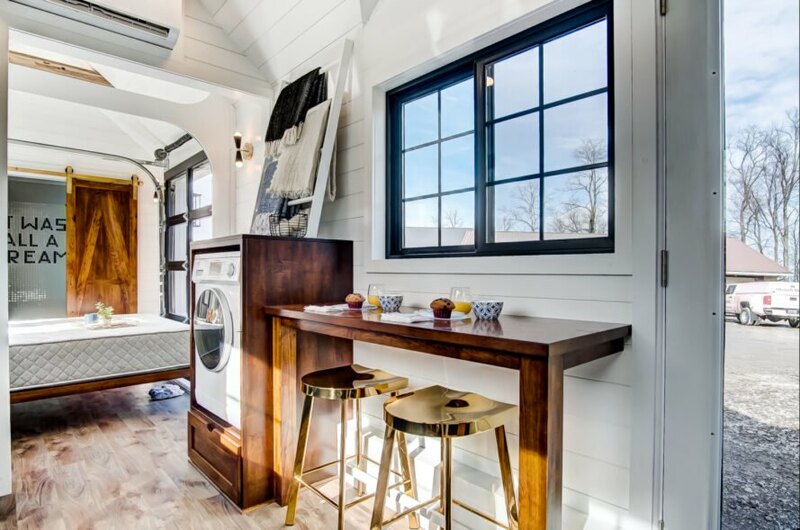 The tiny home is slated to leave NYC on on February 8.